This Linksys EA6900 review is about the needs of a serious gamer, and for users with incredible bandwidth needs, the Linksys AC1900 Dual-Band Smart Wi-Fi router is the granddaddy of all contraptions. While it might be in its own price-range, the functionality, reliability, range, and speeds offered by this router can be very difficult to beat. If like myself you need a network solution that allows for online gaming, video streaming, and sharing, as well as unbeatable and mobile friendly Wi-Fi range, then this router might be exactly the product you have been looking for. By and large, reviews from customers of the Linksys AC1900 have been overwhelmingly positive, with negative reports concerning things which are easy to overlook. Almost all of the customers consider the Linksys EA6900 to be supremely fast in comparison to other routers with concerns about connections, streaming and file transfers and downloads. The AC1900 has also been regarded as a superior solution when it comes to Wi-Fi range and strength. Out of all of these reports, there are very few negative ones, and their complaints can be easily dismissed as relatively petty; ranging from awkward wall-mounting positions to a power cable that is just too short. These minor complaints can be easily overlooked, and if not, can be dealt with just as easily, making them no big deal that should affect your choice of whether or not to buy this item. The advantages with regards to functionality, reliability and of course speed far outweigh these minor negative points. As a gamer with high demands on bandwidth for streaming, sharing and online play, I would certainly recommend this router over many others in the price range. Firstly, those who need to have a reliably functional wireless network in every area of their home that connects to a high number of devices will see immediate benefits from the AC1900 in terms of connection strength, range and capacity. With Beamforming technology, these people will be able to turn their homes into Wi-Fi hotspots that have next to no interference. For those with high bandwidth demands such as those who rely on in-home streaming from platforms such as Netflix. Those who are looking for an online play with minimal lag and disconnections, as well as anyone looking to share or stream their gameplay at 4k, this device can handle anything you throw at it. If you are looking for smaller networking solutions that can handle a minimal number of devices at one time and at lesser speeds, this product might not be for you. You may find that all of the additional functionality, capacity, and speed is way beyond your needs, and so you may benefit far more from a cheaper router that can handle standard networking needs. Additionally, those with limited speed connections provided by their network providers would see very little difference between the AC1900 and their current routers, purely because of limitations posed by the speed of their own lines. For normal online play, streaming that is below 4k and standard speed lines, the AC1900 offers far more than can be used by these users, making the most desirable parts of its functionality all but useless for these types of users. Provides N600 Mbps on 2.4Ghz and AC1300Mbps on 5.0Ghz Wi-Fi frequencies. Next generation Wireless-AC which is 4.3x faster than Wireless-N.
1x USB3.0 and 1x USB 2.0 for fast and easy media, file and printer sharing across the home network. Beamforming Wi-Fi technology to ensure stronger and faster connections on all of your devices from anywhere in the home. Dual Core 800Mhz processor for the high-speed handling of data when streaming, sharing or playing online. 4x Gigabit ports for direct connections. Linksys Smart Wi-Fi App, easy to setup software and remote management and monitoring of bandwidth allocation. Cross-platform compatibility with PCs, Macs, smart devices and gaming consoles. Higher price than other products. The Linksys EA6900 features the Linksys Smart Wi-Fi App which allows you to monitor and manage your home network from the comfort of your tablet or smartphone. It allows you to allocate guest access, manage parental controls, and also allows you to prioritize bandwidth to certain devices such as those that serve to stream or share media, or need bandwidth to enable lag-free online play. This feature also allows you to manage your network remotely from any location using your smart devices, allowing you to keep a finger on the pulse of your home network from anywhere and at any time. The Linksys AC1900 provides superior speeds and reliability in terms of Wi-Fi connections thanks to its next-generation Wireless-AC which outperforms wireless-N at speeds of up to 4.3x faster. This in conjunction with the provision of 4-gigabit ports, 3 external antennas, and a dual-core 800Mhz processor to assist with the smooth handling of data makes the AC1900 one of the fastest and most reliable products in its price range. Beamforming technology assists with limiting Wi-Fi interference by optimizing and focusing wireless signals to any connected devices. This means that the Linksys EA6900 will provide you with a stronger connection. No matter where in the home you are while ensuring that your mobile devices such as smartphones and tablets stay connected while enjoying peak performance at all times, and in all locations. This also helps to eliminate any dead-spots in your home, since Wi-Fi signals are not sent out in a radius, but are rather directed straight to your devices. The Linksys AC1900 comes packed with many things such as a CD, a user manual, three external antennas that are detachable, a router internet cable, a power adapter, a small quick start guide booklet, a warranty and of course, the router itself. 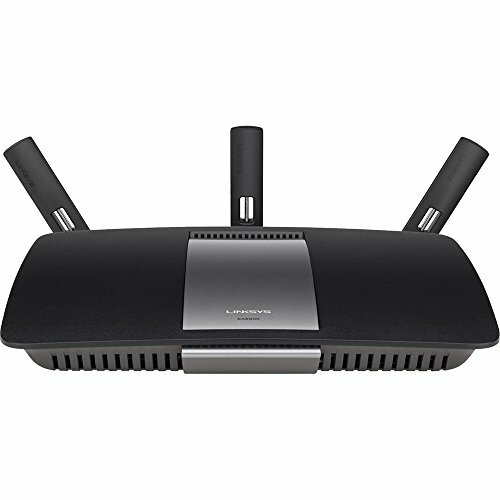 Firstly, those who need to have a reliably functional wireless network in every area of their home that connects to a high number of devices will see immediate benefits from the Linksys EA6900 in terms of connection strength, range and capacity. For high bandwidth demands such as those who rely on in-home streaming from platforms such as Netflix. The Linksys EA6900 provides superior speeds, more stable wireless connections at a greater range, as well as unparalleled processing capacity; all in a sleekly designed, compact device that can manage the entire network of your home. It has become the perfect addition to gaming rigs all over the world; and for the price, could be the next best part of yours. We hope you liked our Linksys EA6900 review, if you have any suggestions or questions please contact us, we are always looking for new ideas.